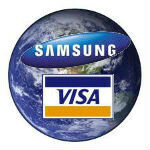 This isn't the first deal that Samsung and Visa have made for mobile payments via NFC. The two companies first started working together for the London Olympics last year, but this new deal has a much wider scope, and will have a much bigger impact on the Android ecosystem and Google Wallet in particular. The new deal between Samsung and Visa is a worldwide NFC deal, and it will mean that Visa's payWave app comes preinstalled on every new Samsung device that has NFC. The deal also includes an interesting rider allowing adding the option for financial institutions to launch large scale mobile (NFC) payment programs using Visa’s Mobile Provisioning Service (MPS). By employing MPS, Samsung will offer banks the ability to load payment account information over-the-air to a secure chip embedded in Samsung devices. This is a big deal for Samsung and Visa, but given how much sway Samsung holds in the mobile market, especially the Android ecosystem, it could be trouble for alternatives like Google Wallet and ISIS. Both Google Wallet and ISIS offer more functionality by allowing other cards aside from Visa. It's unclear how the contract with Visa would affect Samsung's ability to offer other mobile payment apps, but at the least there's no doubt that Samsung and Visa are going to put a lot of marketing behind this effort, which could drown out the competition. Wtf? Do you like to randomly piss on apple even when the article has nothing to do with Apple? Well I could say that it's exactly the same as when you say useless, unrelated things about Android in Google articles. I don't mind some Apple hate now and then..
Wow now Google should be really concerned, Samsung might launch its own search engine anytime now, sleeping with the enemy? Michael, I don't see trouble for alternatives like Google Wallet and ISIS; I mean, there still is Mastercard and American express with Paypal; ans as far as Samsung being a large part of Android ecosystem?, well history teach us ( please see HTC's history) things changes every year. LG, Motorola and HTC with Nexus brands is lookings might fine :). In spite of what your comment states this is a MAJOR DEAL to the android ecosystem STOP FOOLING YOURSELF. Google has had MAJOR ISSUES with Google wallet mainly because of Verizon and it's overall refusal of using Google wallet on handsets running on the Verizon network due to security issues. Now think about it even if you had the Verizon Galaxy Nexus it still didn't come with the ability to install Google wallet. That say so much about the overall relationship between Verizon and Google. Now let's talk about this silly statement ''Well history teaches us things change'' as if Lg, Motorola, Htc, and Nexus line devices are going to be better than Samsung devices. That's the BIGGEST CROCK of wishful thinking i have ever heard. Samsung has all the market share the comical thing is you can put Htc, Lg, and Motorola together and add their market share and it won't compare to Samsung. Bottom line folks Samsung is android plain and simple. When you walk down the street or get on a train or bus in main street USA or standing in line at a bank or sitting in a movie theater and a person pulls out their smartphone what do they pull out???? They pull out the Galaxy S2, Galaxy S3, or Galaxy Note 2 or the Apple iphone. You rarely see Lg, Sony, Nexus devices, or Motorola. Now you see Htc and it's Evo 4g, Incredible, and basically that's it. Samsung won't be dropping from the top spot anytime soon their devices are the BEST totally industry leading due to software and features solution. Nexus line or any other Manufacturer can only wish they could compare. So true, if anything, those other OEMs should be VERY worried about this deal, Samsung are truly leading the way in almost very way now with this in mobile. The next iPhone will most definetly have NFC due to this, I'm sure. Go back a few years and you were saying the same things about HTC (when you had their EVO phones). So apparently, things do change. Everyone seems to think that once one of the tech companies starts showing dominance, that it will last forever. Apple, Samsung, Microsoft, and android fans figure that once their respective company starts gaining a lead that it's all over for everyone else. Look at any industry, and you will see peaks and dips in any companies business. Oldsmobile had the highest sales of any manufacturer for a few years awhile back, now they're gone. Car audio companies like Orion and PPI were the top dogs for awhile, now they're owned by someone else and cranking out mediocre products that trade on their past reputation. When was the last time you saw a Zenith TV for sale? Sony had the portable music industry locked up in the 80s & early 90s, where are they in that industry now? For something like this, there needs to be a universal system. The reason being you are tied to this device, it's not like having multiple credit cards so you can guarantee that you can purchase from any vendor, now your card is embedded into a $500+ piece of technology that will most likely also be tied into a multi-year contract with your cell provider. If you have a Samsung phone and purchase a lot of stuff from a business and they decide to stop using Visa (and there are quite a few businesses who do this because of the charges Visa levies on them to use their service), your screwed. It's not as simple as picking up a second credit card, now you have to deal with a new/second phone and contract, all for the opportunity to spend money at these retailers. This is I believe one of the reasons nfc payment hasn't taken off. Look how long it took many places to add CC billing to their payment options, and some still don't have it (rare but sometimes is the case). This whole system is on the road to a huge CF if they don't set up some type of standard for how it works. I fear we're looking at the next VHS vs Betamax, HD DVD vs Bluray, FireWire vs USB type of situation. But the stakes are higher here because they're dealing with people's finances and personal info. I would think that there should be some regulatory bodies overseeing this when dealing in those matters. Google Wallet is working just fine on Sprint phones. You can load ANY credit / debit card including Visa, Master Card, American Express and Discover in addition to gift cards and reward cards. You can rest assured that this will only increase purchases of Samsung devices. I hope they start this partnership with the Galaxy Note 3. This only strengthens Samsung and it's dominance over any other android manufacturer including Google with the Nexus line devices or this silly little Motorola X phone stuff. The contents of your comments on multiple sites are quite amusing judging by how old you appear in your photo. Why wait till the note 3 to start, what's wrong with the s4? Who's to say current Samsungs won't benefit from this? Seems all that would be required is a FW update and an app. yea this was predicted quite awhile back, that samsung would trade places with apple and begin a quest for world dominance, such as the one apple has recently began getting knocked off of.....so sammy if you chose this greedy,prideful, and selfish road know that some BAAAD things will happen to you too inspite of all your "false" glory. You are actually going at Samsung for being successful? Lol, what on earth is wrong with you? Oh yes, you're a Sony fan, nothing wrong with Samsung dominating, they are making the best Android smartphones on the market, unlike Sony who seem to make one dud after another. Yeah, you need to get over it. You keep saying the most ridiculous things. If Sony or HTC were in the same position, I'm sure your comments would turn around 180. You're essentially faulting a company for making money & being successful. Last I checked, that was the point whether you like them or not. Google Wallet is a really nice product, but i hate that it's only available in USA, so I hope this new deal between Sammy and Visa will bring this feature worldwide, and after i heard that the SG4 won't equip the octa cpu nor s-amoled screen, i was going to upgrade from SG3 to HTC-one for it's better build material, 4.7-1080-466 dpi, stereo sound and the new 4UP f/2.0 camera tech; but features like Business SAFE, e-wallet, faster Android upgrades, etc... make me think twice about leaving the SG line. Now, Google is bringing down it's top dog. Good!!!! cos lets face it, Google wallet was never gonna work. maybe in the larger cities of america it did, but back in the land of old ye world ye England (where Google wallet isn't even available) it was never gonna. specially when shops and businesses would have sign in to a new payment system and then rent the equipment need to run. I've been waiting for visa to launch a NFC payments service since the early days of NFC and Google wallet. Plus i bet i runs on current systems which wont require the use of new equipment. On a final note, every smart phone I've owned has been a Samsung and not planning on changing brand anytime soon.